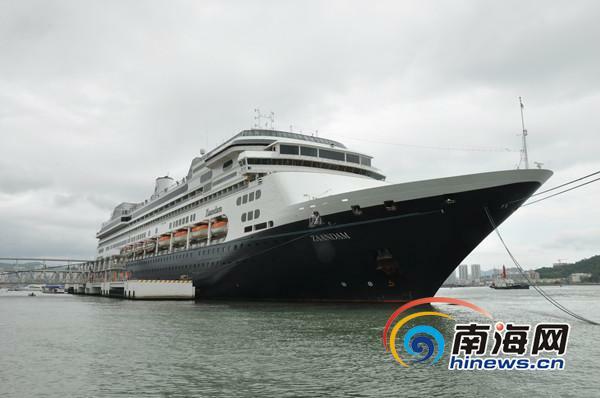 Carrying 1,461 passengers from Europe, U.S and Australia, the Holland America Zaandam Cruise ship called at Sanya Phoenix International Cruise Terminal for the first time on the afternoon of 19th Jan, reports hinews.cn. Zaandam is a cruise ship owned and operated by the Holland America Line, named for the city of Zaandam, Netherlands near Amsterdam. It was built by Italy’s Fincantieri yard in Venice and was delivered in 2000. Zaandam has a musical theme and is decorated with artifacts and memorabilia from different musical genres. Items such as a Baroque-style Dutch pipe organ and guitars signed by the Rolling Stones, Carlos Santana and Queen can be seen. Zaandam will berth at Sanya port 4 times from 19th Jan to 28th March after this visit, bringing 1,500 passengers each time. The Sanya Phoenix International Cruise Terminal will receive another 5 cruise ships during the 7-day Spring Festival holiday, according to Mr. Zeng Xianyun, managing director of Sanya Phoenix Island.